One of the challenges is radio astronomy is keeping your data free from extraneous signals. Humans use radio waves and microwaves for everything from transmitting music and mobile phone data to cooking a quick dinner. For this reason radio telescopes are often in fairly isolated places, such as the radio quiet zone in West Virginia or the ones in Australia. These limit the amount of contamination from stray signals. But astronomers who work at these remote telescope sites also have to live there, and they utilize things like microwaves in their daily lives. Sometimes that leads to some interesting science. You might remember a while back I wrote about some strange signals being detected by the Parkes radio telescope in Australia. They were short, seemingly intense bursts of radio energy that would appear in the data from time to time. They seemed to fall into two groups. The first, known as perytons, had all the markings of being terrestrial. They were detected by a range of detectors rather than specific ones, and they didn’t show evidence of frequency dispersion, which is seen in deep space radio signals. The second type is known as fast radio bursts, or FRBs. These are also short lived, but have frequency dispersion and seem to come from specific directions in the sky. The general consensus has been that FRBs are astrophysical in nature, while perytons are terrestrial. But it wasn’t entirely clear what perytons were. Now a paper published on the arxiv seems to have found the cause, and it’s hungry astronomers. The team began to wonder how a burst of radio energy might be produced locally. Since Parkes is in a radio quiet zone, that would seem to make the most sense. One obvious possibility is a microwave oven, but these operate at about 2.5 GHz, while the peryton signals were around 1.4 GHz. But when the team looked through the peryton data, they found that each peryton was accompanied by a 2.5 GHz signal. They also found other 2.5 GHz signals that weren’t accompanied by perytons. 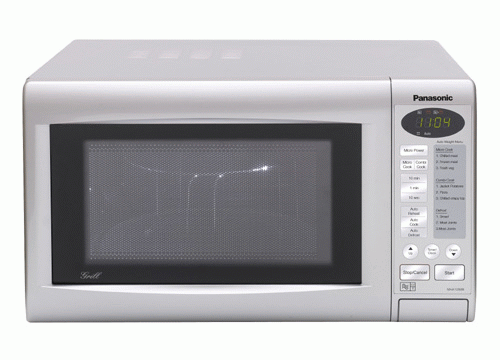 The team speculated that perytons could be due to a microwave oven when the door is opened while still running. When you open the door of an active microwave oven, there is a short burst of radio waves as the oven is still powering down. This burst of energy isn’t harmful, but it could easily be picked up by a radio telescope. To test this idea, the team looked at where the telescope was aimed when each peryton was detected. Sure enough, a microwave was in the line of sight each time. Just showing a correlation between perytons and an astronomer’s desire for hot pockets isn’t proof, but it seems reasonable given the evidence. The authors point out that if a peryton is detected without a corresponding 2.5 GHz signal, then that would disprove this hypothesis. It’s important to point out that this does not demonstrate that FRBs are caused by microwave ovens. Perytons and FRBs are distinctly different in many ways. In fact, demonstrating a terrestrial origin to perytons helps us narrow down the astrophysical causes of FRBs, since it provides a simple way to distinguish them. Astronomers were the turkeys all along. would these radio telescopes be able to detect the signal from the astronomer’s cell phones? Don’t you mean GHz or Gigahertz rather than MHz or Megahertz ? Good luck heating your pop tarts at 2.5 Megahertz. You also have to wonder at the mentality of people who let a Microwave oven into a supposedly “Radio Quiet” zone. Haven’t they heard of cooking with gas? And with matches. Not those piezoelectric spark lighters. So noted about the frequency typo and corrected. A radio quiet zone doesn’t mean you can’t use anything that creates electromagnetic waves, but rather that certain restrictions are placed on transmitters and the like. The microwave oven issue is an odd fluke. Oh man, I laughed so hard. I knew, when you described these signals a short while ago, that something seemed mighty fishy, but this is way more hilarious than I could have ever guessed. I wonder if they’ll start putting the microwaves in their own shielded rooms now.